Natural latex glove. For excellent dexterity and durability. Flock lined for ease in putting on and taking off. Rolled cuff for extra durability 12" long. Resists a wide range of acids, alcohols and salts. Diamond pattering grip finish. Yellow. Retail packageing, each pair in poly bag. Available in S, M, L, XL, and is USDA approved. Natural latex flock lined heavy duty industrial weight 32 mils thick 13" long for better protection. Rolled cuff for tear resistance. Rough finish for excellent grip. Available in sizes S, M, L & XL. Extra strong latex glove flock lined S-XL. Same as HL-100 in blue. 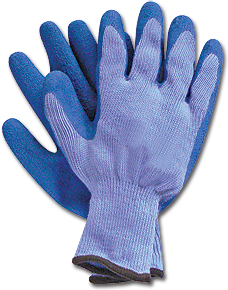 The ergonomic design, soft strong cotton, knit shell and flexible palm coatings makes it one of the most comfortable and versatile work gloves. This is a comfortable fit glove for gardening, fishing, sailing, construction and general work.